Los Alamos Neutron Science Center is the major experimental science facility at Los Alamos National Laboratory, underpinning the Laboratory as a world-class scientific institution. Since 1972, the 800-million-electron-volt (MeV) accelerator and its attendant facilities at Technical Area 53 (TA-53, often referred to as "the Mesa") at Los Alamos National Laboratory have been a resource to a broad international community of scientific researchers. The Los Alamos Meson Physics Facility (LAMPF), as it was originally called, hosted about 1000 users per year to to perform medium energy physics experiments. In 1977, a pulsed spallation neutron source was commissioned to supply moderated and unmoderated neutrons to time-of-flight experiments in the facility called the Weapons Neutron Research (WNR) Center. 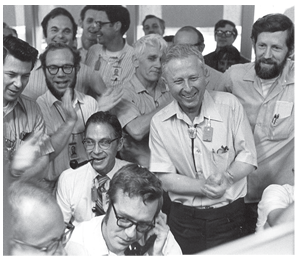 Neutron scattering experiments were started immediately and by 1983 the Department of Energy’s Office of Basic Energy Sciences was funding a formal user program. Beginning in 1985, with the completion of the Proton Storage Ring (PSR) that compresses proton pulses from 750 microseconds to a quarter of a microsecond, the Los Alamos Neutron Scattering Center, now known as the Lujan Center, was established while WNR was expanded to other spallation sources on the accelerator beam. In 1995 LAMPF was renamed the Los Alamos Neutron Science Center (LANSCE) to reflect the broad base of neutron research being conducted on behalf of the weapons program and basic research; the name of the BES neutron scattering facility was simultaneously changed from LANSCE to the Manuel Lujan Jr. Neutron Scattering Center. In 1996, a Memorandum of Understanding was established between the Department of Energy's Offices of Energy Research (ER) and Defense Programs (DP) to define the stewardship of the facility and its experimental areas in the context of the new Scientific Stockpile Stewardship Program. In 2001, the MOU was rewritten to include three branches of the Department of Energy (DOE)—the National Nuclear Security Administration Defense Program (DP), the Office of Science (SC), and the Office of Nuclear Energy (NE)—and the Laboratory officially designated LANSCE as an approved user facility. Several key events have occurred during the last 20 years that have fostered the growth of the user programs at LANSCE. In 1968 through 1995, the DOE Office of Energy Research (ER) funded LAMPF as a user facility for medium energy physics and a user group was incorporated in 1972. Beginning approximately in 1977, Office of Basic Energy Sciences has provided funding of a new experimental area completed in 1990, including office space, the Los Alamos Neutron Scattering Center became a Designated National User Facility. In 2011, this status was extended to WNR, pRad, and the Los Alamos Neutron Science Center.